Today, we've got a treat for you: the final post in our series on the current jewelry exhibition at Koldinghus in Denmark! This entire set of posts would not have been remotely possible without the generosity of Alberta, one of our readers who attended the exhibition and kindly offered to share her photos with us. 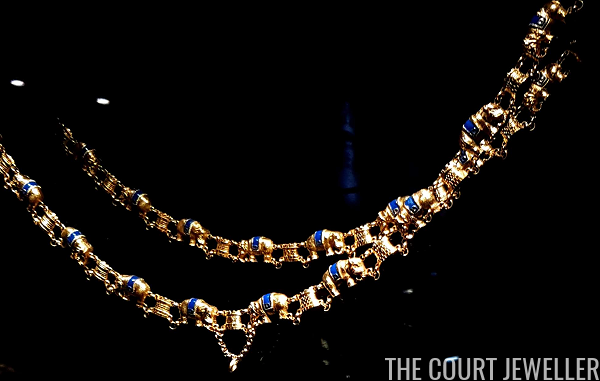 Royal women aren't the only ones throughout history who decorated their possessions with gems and jewels to reflect their status. 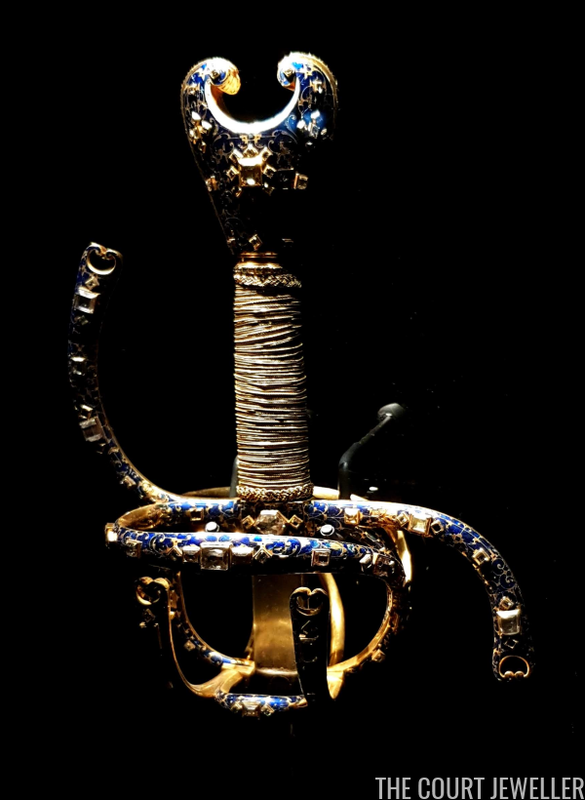 Here, note the embellished hilt of this sword, which belonged to King Christian IV (1577-1648). The grandest ornaments worn today by male royals are generally chivalric orders, especially the ones that have magnificent collars as part of their insignia. The highest-ranking royals, both male and female, in Denmark are often seen at the annual New Year's Levee wearing the collar of the Order of the Elephant, the nation's highest order of chivalry. 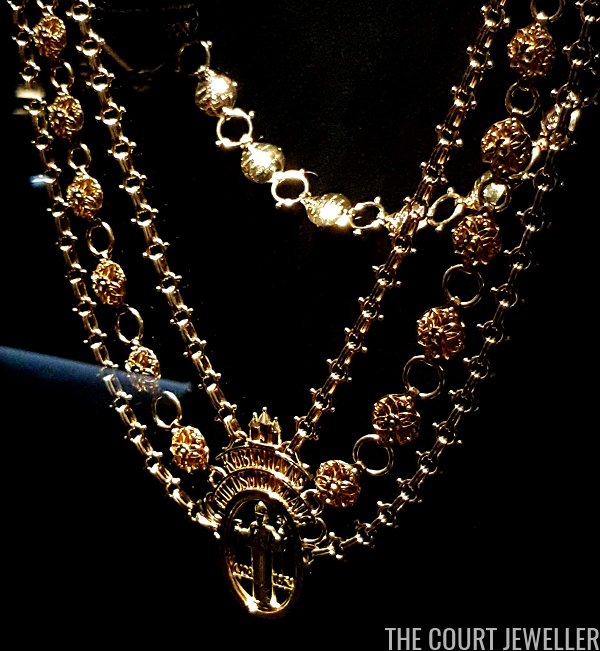 The collar features alternating elephants and castles in its design. Denmark's second-highest order of chivalry, the Order of the Dannebrog, also includes a collar in its insignia. This collar features alternating Dannebrog crosses with two royal cyphers: that of King Valdemar II (1170-1241) and that of King Christian V (1646-1699). 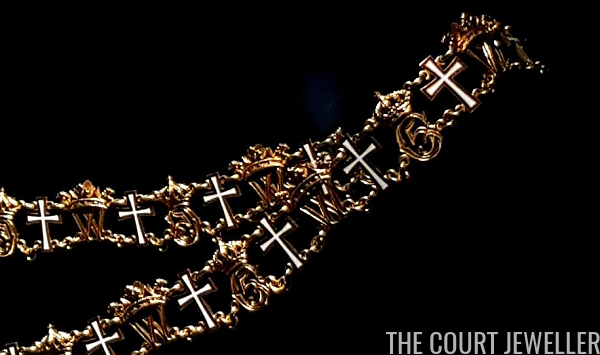 This elaborate collar isn't part of an order of chivalry: it comes from Copenhagen's Goldsmith Guild. Members of the royal household also have objects of power in their possession. 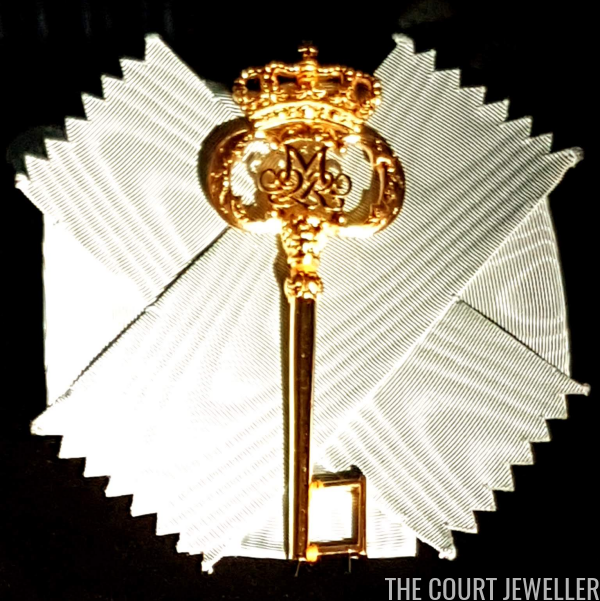 This is one of the keys of a chamberlain of Queen Margrethe II. Like Britain, Norway, and Sweden, the royal women of Denmark wear Royal Family Orders. This is the badge of the Royal Family Order of King Frederik IX, which belongs to his daughter, Queen Margrethe II. The Koldinghus exhibition revealed that the diamond frame of this badge is much older; it originally held a different (now lost) portrait and came from the collection of Empress Amelie of Brazil. The diamond frame was previously used by Queen Lovisa (holding a portrait of her husband, King Frederik VIII), Queen Alexandrine (holding a portrait of her husband, King Christian X), and Queen Ingrid (holding this portrait of her husband, King Frederik IX). 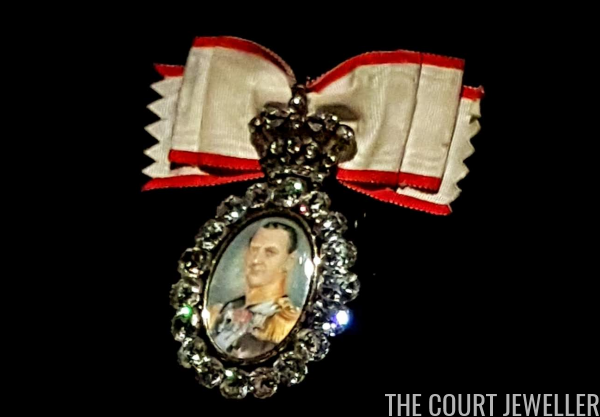 Queen Margrethe began using the badge at the start of her reign, and a new badge with a new portrait of King Frederik IX was made for Queen Ingrid. These two badges of the Royal Family Order of Queen Margrethe II belong to her daughters-in-law. The top badge is worn by Crown Princess Mary, while the bottom badge is worn by Princess Marie. 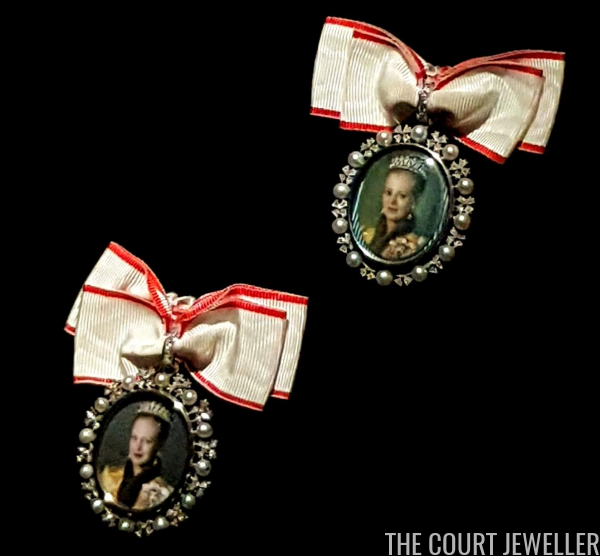 Both of the frames were newly commissioned for the princesses. 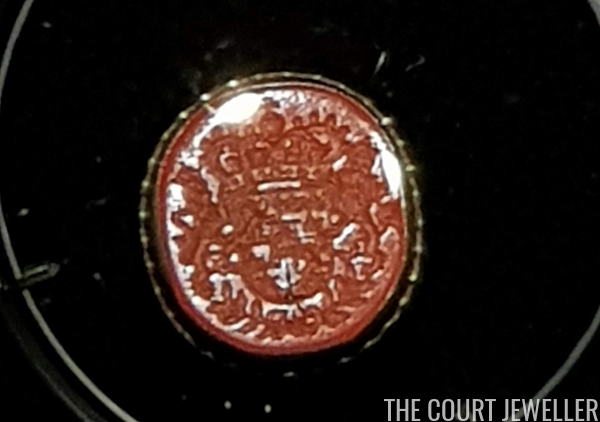 Another accessory that functions as a symbol of power is the signet ring. This one belonged to Queen Christina of Sweden (1626-1689), one of the most fascinating and educated women of her time. 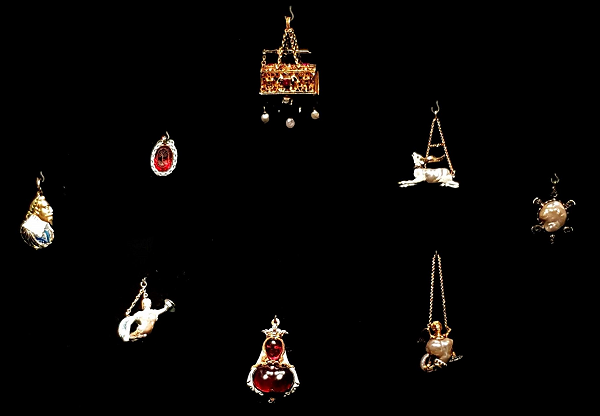 The exhibition also includes other bejeweled trinkets that belonged to Queen Christina. Incredible thanks to Alberta for her generosity in sharing these images with all of us!